2008 World Series Champions Philadelphia Phillies! Is it insane to make a blanket out of sock yarn? I mean, Shelly did it, and so did Deb. So it's definitely possible. 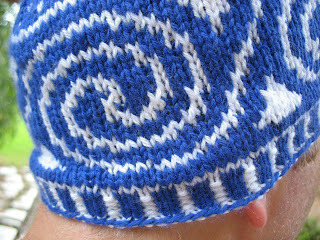 Have you seen this one by Birgit? It's amazing. So I've toyed with the idea for a while now. I have a lot of leftover sock yarn, thanks to small feet and short, bug calved legs that require shorter sock legs. And readers of this blog know that I am always looking for ways to use up those leftovers. Using up scraps to make something as useful as a blanket feels so thrifty and resourceful. But it's sort of insane, right? Sock yarn is thin, and even in crochet, it takes a lot of time. But I do have a lot of leftover sock yarn. 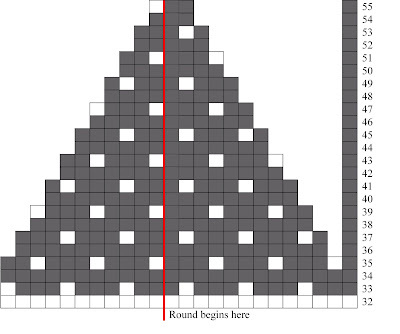 And I quite like crocheting blankets, lots more than I like miters. I hardly ever get a turn under the other wooly scrap blanket. And now it is cold, and wooly blanket is a necessity. So, crazy or not, I'm making a Granny Rectangle with my sock yarn leftovers, except that I think I'm running out of yarn, and it's only about 30" x 36" at this point. I'm sticking to the cool colors - the blues, greens, and purples and I don't want to vary the color scheme. So I suppose I'll have to generate some more leftovers: knit up some of the blue/green/purple sock yarn from the stash, and have more leftovers to add to the blanket. OK. Now that does seem a little crazy. 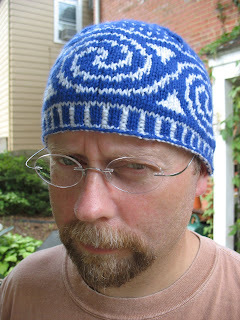 Knitting a project just to generate leftovers? My son brought some schoolwork home from school the other day. There was one paper, his writing practice, that said, simply, "I like my mom." I was, predictably, very touched by this. I swept him up in my arms, and expressed my delight in his writing. "Oh, I like you, too!" I said enthusiastically. "And look at how carefully and neatly you wrote this!" He smiled broadly, "Well, I didn't know how to spell 'ice cream,' so I just said I liked you. I could spell that!" Rather than being properly deflated, I accepted my fate as being second-best to ice cream and easy to spell, and got even with him, the lazy-knitter's way. I cast on zero-effort stripey socks for my boy. It's Socktober, after all, and my Through the Loops Mystery Socks are too tight and the cable pattern requires too much attention during post-season baseball. I needed an easy sock, an instant gratification sock, and I can use the ugliest, cheapo stuff out of the sale bin (and only one skein needed for a pair for a small boy! ), and crank out a pair of socks in a matter of days. No fancy yarn, no fancy pattern. Nothing. I don't even bother to match the stripes. So there, kid. Take that, Mr. Easy-to-Spell. Simple socks, details on Ravelry. So I get a simple declaration of love to cherish forever, along with a funny anecdote, an enjoyable knitting project, and an all-around great kid. He gets a new pair of socks, and the Mom who makes them. I think it's a fair deal. How do you thank someone for rescuing you from the blue screen of death? 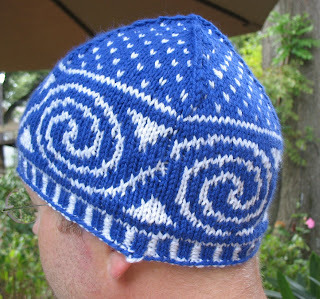 Why, knit him a blue swirl cap! 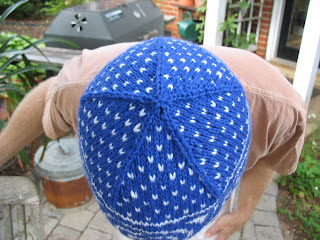 This was a quick knit for Jorge while he was retrieving data and upgrading our hard drive. He deserves much, much more. Notes: This is an adult medium cap -- not quite covering the ears. I cast on 120 sts using a 2 color long-tail CO method. I think the effect of the 2 color CO might be lost due to some curling at the bottom, but I do so love this CO. Here is a video tutorial for all those who don't already know this CO. It includes instructions for a rather clever braid as well. Knit 10; slip 2 stitches together knitwise, knit 1, pass slipped stitches over; knit 11. Round 56 is k2tog all around. I don't always like colorwork in DK weight, preferring sportweight or sockweight yarns, but the softness of the yarns and the quickness of the project won me over! The Backbou as a reluctant model. I'm going to be honest and tell you that my September pretty much sucked. I am not one of those super-controlling Moms (really, I'm not), but I find it difficult to release my children to the big bad world of elementary school. I prefer them in my supportive and accepting bubble of Mom-Love. And since my firstborn takes a long time to warm up to new situations, there's always a long period of Getting Used To It that requires a lot more Mom-Love and Mom-Listening and Mom-Deep-Breathing than the usual amount. Throw in a case of Back-to-School head lice (yep, it seems the buggers really like us XRK families), car batteries dying at very inopportune moments, serious overscheduling, colds and allergies, the collapse of the American economy, and a flooded laundry room, and I was so ready to see the end to the month of September. I was ready for some comfort, and thanks to my husband and his Jewish traditions, this week brought us Rosh Hashanah. I needed to celebrate a New Beginning. I needed to ask for blessings for a sweet new year, and I needed matzo ball soup, challah and a big hunk of Aunt Cookie's kugel. Mr S's Aunt Cookie makes the most astoundingly good kugel. It is sweet and delicious and incredibly fatty and decadently comforting. And it makes total sense, since Aunt Cookie herself is among the most gentle, comforting people I have ever had the privilege to know. I've never shared a recipe here before, but I do believe I owe the world the chance to eat Aunt Cookie's Kugel. It's a basic noodle pudding recipe. I've slightly modified the recipe that appeared in her synagogue cookbook (I xeroxed it in full years ago) to make it slightly less fatty and to reduce the overall size of the dish. Preheat oven to 350. Cook noodles and drain. Add any dried fruits to the warm noodles. In a separate bowl, cream cheeses together. Add sugar, milk, eggs, and vanilla to the cheeses. Add noodles and fruit to the cheese mixture. Generously coat bottom and sides of a baking dish (probably 8x8 or thereabouts) with butter. Add the noodle/milk mixture, and dot the top with more butter. Sprinkle with cinnamon. Bake for about 1 hour, until the milk sets and the top begins to brown slightly. After a meal like that, with candles and prayers and the most comforting of foods, things began to look up. The calendar page turned from September to October. The Phillies are still playing baseball, and the first brisk days of fall are upon us. I finally got to pull out the wool sweaters. The latest, most comfortingly warm and perfect is Pam's February Lady Sweater, knit with Louet Riverstone yarn. Seriously, I love this sweater. 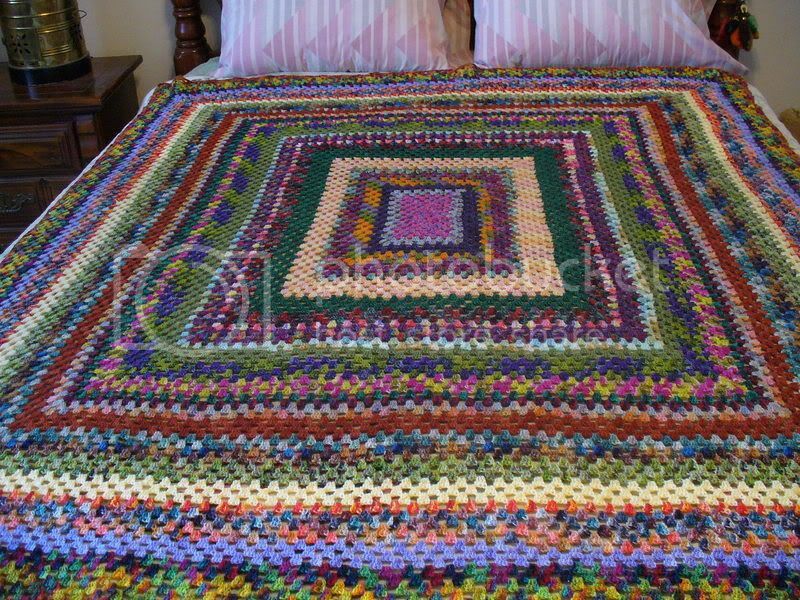 I finished it ages ago, and it has been slung over the chair on the bedroom, waiting to be worn. 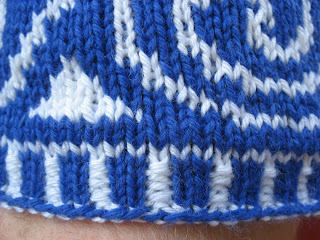 The length is perfect, the fit is great, and the yarn was a great match. I raveled it here if you want details on my mods, which were minimal. October will be better, I'm sure of it.